Anyway, on Friday afternoon at about 12h30 our entire team (along with 2 other teams) left work and headed off on an overnight team-building / knowledge sharing event. We headed out to River Place. As weird as my mood has been regarding work lately, I think it was a great idea and although I was skeptical, we had a lot of fun. With plenty of fun games interspersed with the more serious. I had organised a game of Personal Bingo which we played on arrival (I thought it'd last a lot longer, but people really got stuck right in and it was over in less than half an hour!). We watched a few presentations before dinner and after dinner we had a crazy geeky pub-quiz type game. And then there was just a lot of hanging out, drinking, smoking hubbly and playing Rock Band (not me, cause I think it's just the most boring game of tetris ever!). I went to bed about midnight. And the stories that came out the next morning about the boys' drunken antics were quite entertaining. Breakfast was good. Pity the shower in my room was so disappointing! (Not what I'd expected from such a nice place, but I survived - Am considering it practice for my upcoming trip to Botswana ;) Haha). After breakfast we split up into teams for a Geek Seek game (a treasure hunt across the grounds of River Place). Good fun ... although it is tricky having too many Alpha personalities on a team, and some people are just way too competitive about things. Haha. But still, good fun. And then it was time for lunch. Disappointing that it was pretty much almost exactly the same menu as dinner. But the food was good. Just *alot* ! And then there were a few more presentations, a prize giving and then it was home time. I headed home and spent some time with The Bundles before heading off to The Trucker's. We had a lazy evening on the couch, which was exactly what I needed after being on the go and surrounded by people for the entire first half of the weekend. On Sunday morning we tried a new spot for breakfast, Nice in Parkhurst (That link being the inspiration for our visit). Well I won't lie, I started out extremely unimpressed. There is almost no signage and it takes over the pavements outside it's two shops as well as the attached Nice Bookstore. So we had no idea where to go. And then we stood around feeling completely lost, with not a single waiter or waitress even speaking to us. Eventually I stopped one and was told I had to speak to a woman who was outside clearing tables (who I assume is the owner/manageress). Eventually when she came in, she seated us ... but during that time other people had just arrived and taken empty tables. I would've been far more annoyed if there were none available by the time we got helped. After that we headed off to do a bunch of weekend admin and get a head start on the shopping for Botswana. Sheesh, I made a list and everything and we bought an excessive quantity of stuff ... barely any of which was on my list, which is mostly perishables which I'll be getting on Thursday afternoon. Still, I'm really getting excited now. We set the tent up and vacuumed all the sand out of it. Blew up the mattress and lazed on it reading the paper as well. Haha. (Doesn't sound at all like we only have 1 night in a tent, does it?). Also popped home for a bit for a laze in the sun and some apple with the bunnies :) And then we went for an early evening walk and watched Arthur on Sunday evening before I headed home. It's not brilliant, but it's not the worst movie I've ever watched. Hell, it might've just been worth it for how much I laughed at the Magnetic Bed scene. Bwahaha. 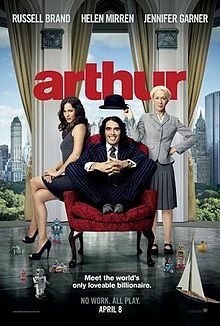 I am torn about whether or not I want to see the new "Arthur"... I love the original.